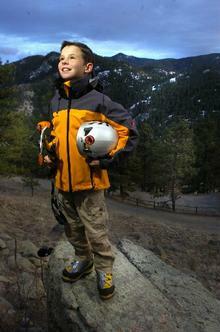 The 11-year-old boy from Boulder, Colorado, who became the youngest person ever to climb Argentina's 22,841-foot Cerro Aconcagua last December, has set his sights on a new project. Matt Moniz and a group of family and friends will attempt to climb 14 of Colorado's 14ers in 14 days to raise money for a sick friend, Ian Hess. The sweet boy has so far raised about $14,000. "Basically, he's my best friend," Matt says. The nine-year-old Ian has pulmonary arterial hypertension and needs about $100,000 in annual medical treatment and medicines. The money from Matt's fundraising climb will help cover the cost that's not covered by insurance. Besides raising funds for Ian, Matt says the series of climbs is a way for him to walk in his ailing friend's shoes. "Ian is always struggling for oxygen because of his illness," Matt said. "What I feel on top of mountains is what he feels every day." So far, besides the Aconcagua, Matt and his father Mike Moniz have summitted two of the Seven Summits, the highest mountains on all seven continents. They've climed Europe's Mount Elbrus and Africa's Mount Kilimanjaro. They've also trekked to Everest Base Camp, where they summitted nearby 18,501-foot Kala Patar. "I might try to do them all some day," Matt says of the remaining Seven Summits. "But I'm in no rush... I like going all over the world, and I get to meet amazing new people." "I can't wait," he said, in anticipation of climbing 14 14ers in 14 days. "Ian helped plan the whole thing, too."